The Formula A cars were now 5-litre and dominated the Continental Championship, leaving the FB cars to scrap over class honours. Only Bill Brack and Chuck Dietrich were doing a full program and both also had domestic titles to worry about: Brack winning several rounds of the Canadian Eastern series and Dietrich comfortably winning the SCCA Central Division title. Brack was first FB car home only once at a Pro series races but was second three times; Dietrich had two class wins and one second place. If the SCCA's preferred 9-6-4 points system had been used, Brack would have won the 1968 FB class title by a single point from Dietrich. Joe Alves, Mike Hiss, Peter Rehl, Fred Stevenson and Mike Eyerly won the other five races but none of them scored any other points in this nominal championship. Hiss and Stevenson were also fastest FB qualifiers at other races but the most eye-catching performance was that of Eyerly, easily outqualifying the other FB cars and winning the class at Laguna Seca in October in a McLaren M4B. Bill Gubelmann was also a contender in his Brabhams, quickest in qualifying at War Bonnet in June and at Lime Rock in September but retiring both times; a point for being classified at War Bonnet being his sum total for the season. And so to the Runoffs at Riverside in November. With no Brack of course and with Stevenson absent, Dietrich looked to have been handed the title when both Gubelmann in his new Brabham BT23F and Eyerly, now in his regular Brabham BT18, failed to complete the first lap. But it was Roger Barr and his Crosslé 12F that ran out winners, comfortably ahead of Dietrich and Rehl. The table below shows Formula B class finishing positions at each of the eight races of 1968 and the points that would have been scored if a 9-6-4-3-2-1 points system had been applied. E&EO. The points table does not reflect the competitiveness of some drivers. For example, at Thompson (R4), Hiss, Gubelmann and Dietrich were fastest in practice but all retired allowing Rehl to take the win. Stevenson was fastest in practice at Mosport (R5) but retired; Gubelmann was fastest at Lime Rock and also retired. 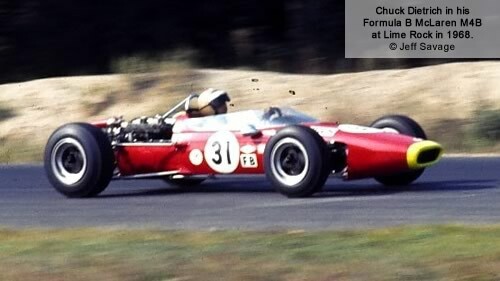 To travel further into conjecture, had there been a constructors title, Lotus would have had 61 points, Brabham 57 points, McLaren 48, LeGrand 12, Cooper 9, Chevron 7 and Crosslé 6. Lotus and Brabham would have been tied going into the last race, showing that even retrospective titles can be exciting. The tables are taken from the SCCA's Sports Car magazine November 1968 and December 1968 pp34-38.